I wrote a post about John 3:16 a couple of years ago expressing four huge surprises that come out of this verse. But I guess the biggest surprise comes from understanding it in its context. Because the verse that is so frequently taken as amongst the best news in the world is simultaneously some of the most devastating news ever delivered. Jesus had arrived on the scene in a flurry of activity. He had simultaneously become the most popular and most controversial figure in Israel, and was causing a stir. For many, there was mounting evidence that this was the promised King they had been looking forward to; but He wasn’t fulfilling their expectations – not quite. Nonetheless, He was attracting the attention of the ‘right people’ – a truth that was evident from the opening of John’s third chapter. Here is Nicodemus, someone who comes from the most religious group going: the Pharisees. In the 21st Century we’re in danger of turning Pharisees into pantomime villains; in fact they were highly respected members of society – as evidence by John’s description ‘a ruler of the Jews’. He was male (which would have stood in his favour in 1st Century culture), and he was a Jew – which made him a part of God’s people. This man was a good guy – and, whatismore, a good guy who seemed to be on the right side of Jesus. His high regard for Jesus (‘Rabbi’) and flattery (‘we know that you were a teacher come from God’) suggest that Nicodemus has made the right conclusions about Him. And so we expect Jesus to reply with the warm embrace – perhaps another wine miracle, or a description of the great banquet which Nicodemus is to enjoy? We want to tell Jesus that He’s misunderstood who’s in front of Him. We want to point out how good this guy is. Surely Nicodemus is in, isn’t he? Surely the good guy gets the “access all areas” pass to the kingdom? On the contrary, the conversation has turned sour. The verses that follow show an incredulous Nicodemus told in no uncertain terms that he needs a miracle – nothing short of a complete spiritual rebirth. He’s already had his physical birth (‘born of water’) – but he needs something else to happen (‘born of the Spirit’) if he’s going to get into Jesus’ heavenly kingdom1. It’s like he’s holding up a huge “No Entry” sign to the one person we thought would have a safe position in the kingdom. It’s into this context that we find ourselves reading the famous words of John 3:16. And they remain powerful and incredible words that I’m grateful are etched on my mind. But they’re spoken in a context to a man who isn’t believing – one who, instead, appears to be marvelling at what Jesus has said2. They remain an amazing offer to those who would believe – but in a chapter where we’re waiting for Nicodemus to be let in, these are simultaneously sad words. They’re the reason Nicodemus is out. See the way the passage continues. It seems to start positively again when we see that Jesus isn’t coming to bring condemnation. But it’s immediately apparent that the reason he doesn’t bring condemnation is that the world is already condemned. Anyone who doesn’t believe in Jesus is already condemned. It’s not simply that Jesus is feeling too nice to punish people. It’s that the verdict is already clear. Anyone who doesn’t believe in Jesus is excluded from God’s kingdom. 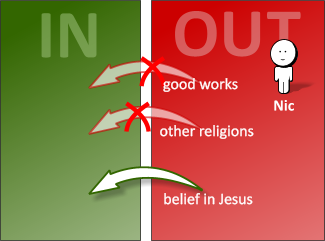 The only way out is belief – trusting in the amazing gift of God’s Son in order to be saved. In fact, He goes further. He says that the natural disposition of the world is to run away from Jesus when He gets near them. Rather than loving ‘the light’ – a title already given to Jesus in John’s gospel 3 – the people love the darkness. They don’t want to be exposed. They don’t want their status as “out” of God’s kingdom to be demonstrated – and so they scurry away in the hope that they can disguise their standing, and pretend that everything’s ok.
It’s what we’ve seen Nicodemus doing in this chapter. He arrives with friendliness and flattery, and becomes increasingly resistant to Jesus’ teaching. By the end of the chapter, it’s clear that he’s someone who doesn’t believe – and therefore is out. I’m not going to pretend for a second that this is easy stuff to accept. On the contrary, I think it’s extremely difficult. But I can’t avoid the simple truth that Jesus is putting forward in these verses. Belief is the only way into God’s kingdom. The world is condemned without Him. John has deliberately chosen this example of Nicodemus – a good man, one of the best – to illustrate the point. If even someone as ‘good’ as Nicodemus can’t get in by virtue of his virtue, then ‘good works’ are not the way that any of us are going to get in. Indeed the net is cast as wide as possible – by the end of John 3:1-21, it’s pretty clear that the whole world has received this devastating diagnosis. Even with the hints of hope in these verses4, the tone is sombre to say the least. It’s hard to see the world this way. It’s hard to acknowledge Jesus’ teaching in this chapter. I suspect I may even have friends reading this who didn’t realise I believe this about the world – and, frankly, I find it unsettling to do so. London becomes an emotionally overwhelming location as enormous crowds pass by every day with the shocking diagnosis in these words. And yet Jesus makes this enormous claim that cannot be ignored. Worse than any diagnosis I ever had to make as a doctor. But far more curable too. How can we believe such controversial teaching? What hope is there for anyone if someone as good as Nicodemus is left standing at the door?